All relationships go through stages as they develop and mature. Client relationships are no exception. It's helpful to understand where you are in the relationship life cycle so that you can better identify the appropriate steps to take to preserve the relationship and hopefully advance it to the next level. There are also inherent risks associated with each stage that it's important to recognize. Whatever stage you find your firm in relative to any given client, there is one constant: Your competitors are vying for that same relationship. That alone makes this discussion more than merely an academic one. You should approach any valued client relationship with a sense of urgency. One survey by RainToday.com found that over half of A/E firm clients are open to switching from their current providers. Don't take these relationships for granted! Courtship. This stage encompasses your business development activities. In courtship, you are prospecting, screening, initiating relationships, submitting proposals, closing deals. The key question in the context of this stage is: Are you pursuing just projects or relationships? I advocate making "relationship potential" at least part of your decision making regarding which prospects to pursue and which to pass on. The reasoning behind this is simple. If we're all agreed that long-term, profitable client relationships are to be highly valued, then why would we not specifically seek such relationships? Instead, most A/E firms focus their business development efforts on pursuing projects rather than clients. I think it wise to define what you want in a client relationship and then go looking for it. Check out these earlier posts for more thought on the Courtship stage of the client relationship--"What Can We Learn From Matchmaking Sites" and "Choosing the Right Clients." Contract. 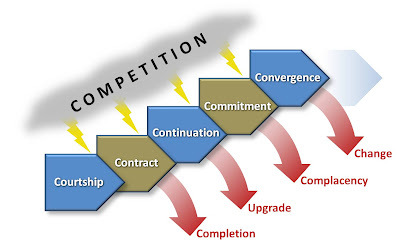 While contract award is often thought of as the terminus of your business development effort, it is only the beginning of the formal client relationship. To draw an analogy from romantic relationships, this is hardly marriage; it's more like cohabitation. There's no long-term commitment at this point, only a pledge to stay together until "project completion do us part." Even at this stage, many A/E firms are still not thinking long term. It's easy for technical professionals to turn their focus to the work rather than the relationship. Of course, quality work will contribute to a continuation of the relationship, but only if there's a relationship to extend. Client relationships rarely end because of technical shortcomings; it's more likely related to a breakdown in the working relationship. That's why it's critically important to do what I call "benchmarking expectations" immediately after contract award (if not before). This involves mutually defining what is expected in terms of the working relationship. For more detail on this, read my earlier post "Building the Relationship After the Sale." Continuation. If all goes well enough, there's a good chance that you'll have another opportunity or more to work with the client. Usually this is reward for passing the test under the previous contract. The terms of that test are defined not only in the contract, but in the client's informal expectations about the the relationship. Fail the test and the relationship ends at project completion (if not before!). Of course, some clients simply won't have subsequent work or prefer to spread it around regardless of how well you do. While it's certainly affirming to reach the Continuation stage with a client, there's little reason to get comfortable here--even if it lasts over an extended period. It doesn't necessarily imply that the client is loyal. In fact, that's probably not the case. Confused? Well remember the earlier point that over half of clients are open to change. In other words, if someone better came along, clients would be tempted to upgrade. Also consider that another study found that only 16% of clients give top grades for A/E firm service and performance. Only one in four would recommend their go-to firms to others. My point is, if you want to reach the next stage in the relationship life cycle, you have to work at it. Most A/E firms boast that over 80% of their work comes from repeat clients. But not all of those clients are committed to continuing the relationship into the future. Indeed, the hard fact is that many client relationships in the Continuation stage are largely sustained by convenience, familiarity, or resignation (vs. delight) that there's not a better alternative. To get to the next stage will be even more challenging than getting from Contract to Continuation. Commitment. At the commitment stage, the client has developed a loyalty to your firm. There's little if any serious consideration of other choices. If your service and performance were scored by the client, you would get mostly fives. This is obviously a great place to be in your relationship with the client. Now you've finally entered the equivalent of marriage. It's not contract to contract anymore; it's for the foreseeable future. Most A/E firms recognize the specialness of the reaching the Commitment stage. They continue to actively invest in maintaining the relationship. But some grow lax, just as in many marriages. When there was still concern about retaining the relationship, the firm was attentive and devoted. Now that it appears secure, some turn their focus to other relationships earlier in the life cycle. Watch out! As I described in an earlier post, even the best committed relationships can collapse under the right set of circumstances. Sometimes it's not any one big thing, but a persistent series of little failures that all add up to a perceived neglect of the relationship. That's why I advise a proactive plan of attack to stave off the risk of stagnation in such relationships. Schedule periodic meetings with the client to review performance and discuss how to take the relationship further still. Define specific, actionable steps. Identify meaningful metrics to gauge progress and follow-through. Specifically budget time to invest in the relationship outside of project work. Convergence. A committed relationship is wonderful, but there is a higher level still. Convergence is reached when your firm becomes an integral, strategic component of your client's business. It's a level very few A/E firms attain. Reflecting on the three levels of client needs, I think there is a correlation between these and the stages of the client relationship life cycle. Meeting technical needs can get you to the Contract stage, and even to the Continuation stage if you do a passable job of meeting personal needs. But to get to the Commitment stage, you'll have to excel at meeting personal needs. Convergence is achieved only when you master meeting strategic needs. You'll never reach this highest stage if you are only a design or technical services firm. This is the realm of the trusted adviser. At this level you are not only responding to your client's strategic needs but helping define what those needs are. You are not only providing solutions, but have become an essential part of those solutions. You are both consultant and practitioner. So what can you do with this right now? Let me suggest that you get your management team together and review your client list, identifying where each client relationship currently is relative to the five stages described above. Be brutally honest. Then outline what steps are needed to take each relationship (at least the ones you want to retain) to the next level. If that seems too ambitious, then do the exercise only for your top clients. I'm convinced you'll be well served in going through such an analysis. Better still, so will your clients.